Harness the potential of educators to empower students to do what they do best. We're helping K-12 schools use a strengths-based approach to stand out by focusing on what they naturally do best. 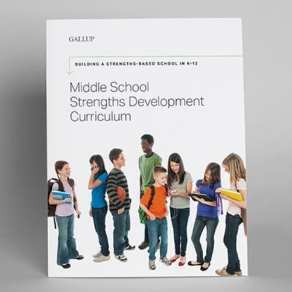 A strengths-based school uses comprehensive strategies that inform all aspects of the school and focus on a systematic strengths development process for educators and students. By helping students discover their talents and develop their talents into strengths, educators will have a lifelong impact on young people. 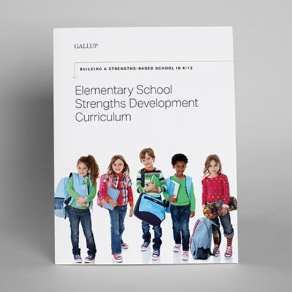 Gallup's strengths-based development courses teach educators how to nurture students' talents. When students know what they do best and have opportunities to develop and apply their talents every day, school communities are transformed. In this course designed for school leaders, strengths champions and student-facing educators, you will become more aware of your strengths, develop a deeper appreciation of them and use them more frequently while in the classroom. In this course designed for student-facing educators, you will learn the tools to guide students through a comprehensive strengths development process. In this course designed for school leaders and strengths champions, you will gain the tools to develop a comprehensive implementation plan designed to build a strengths-based school. A strengths-based approach to teaching and learning provides a common language that focuses on what is right with people rather than what is wrong. Help your students discover and develop their unique talents with these tools and resources. This curriculum features 25 lessons that include objectives, talking points, setup instructions and extension ideas. 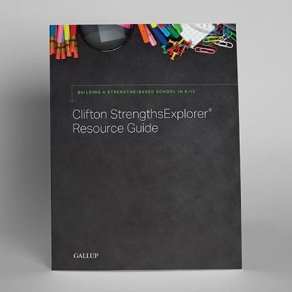 This resources guide includes detailed descriptions of each CliftonStrengths Explorer themes, questions and action items for students and adults. 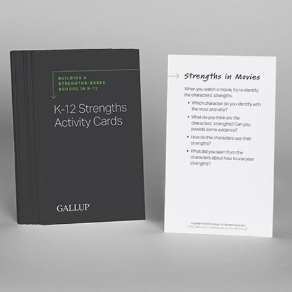 This card deck includes 40 fun and engaging activities that are designed for students to use on their own, with a partner or during classroom time. This curriculum features 22 lessons that include objectives, talking points, setup instructions and extension ideas. 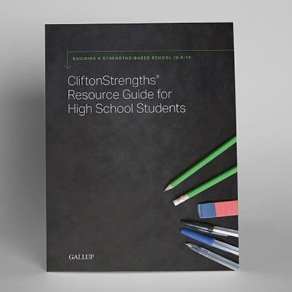 Discover how to use these tools and resources from our webinar Building a Strengths-Based School with Gallup's K-12 Offerings to help transform your school today. Begin your approach to developing your students' talents. Get me in touch with a Gallup Education expert so I can bring these courses to my school or get further information.